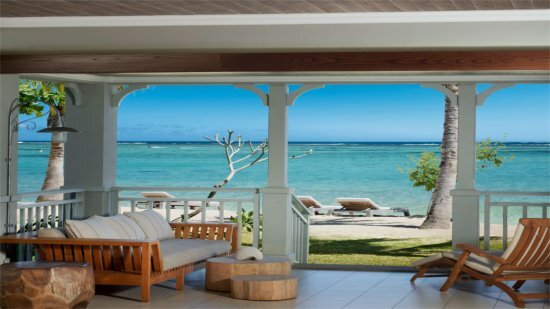 Poised on the edge of an aquatic oasis in a sublime tropical setting on Le Morne Beach is the family-friendly St Regis Resort. 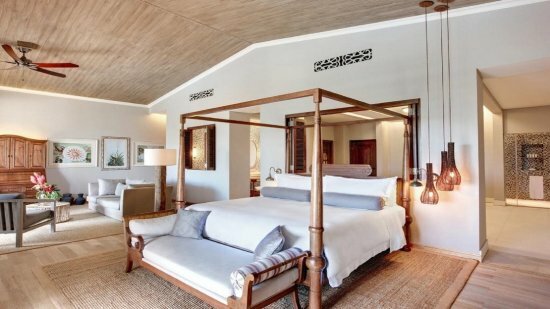 Proudly looking over the dazzling Indian Ocean are bespoke accommodation choices unveiling perks such as private pools, spacious open-plan lounge areas that utter pure indulgence, private entrances and bedrooms opening onto beach access and plunge-pools. Romance and luxury personified! Just as exquisite are the gastronomic delights at St Regis with a distinct culinary experience assured; anything from the exotic South-east and innovative Japanese to traditional Mauritian and classic Western favourites. Action and adventure, peace and tranquillity, underwater discovery or leisurely sailing days, the choice is entirely yours. St Regis offers an unparalleled service in every way promising to deliver a contagious mix of activities and sports, spa pampering and beauty plus fabulous dining experiences for all ages. It’s a union of luxury and services that stand out from the rest. 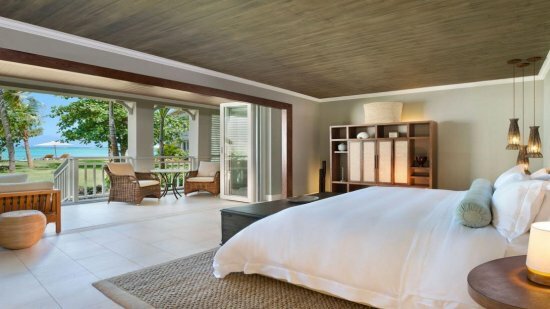 The St Regis Mauritius enjoys a stunning beachfront location. The hotel enjoys a secluded location nestled between lush, tropical forest and white sand beach. 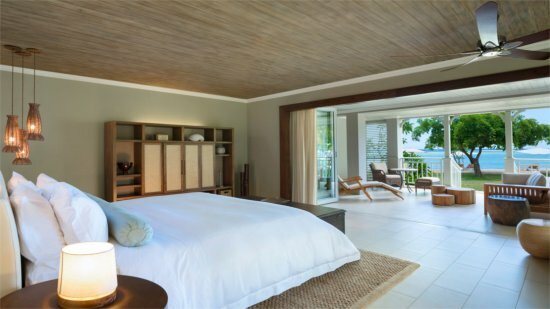 All necessary amenities for a perfect stay in paradise can be found onsite. 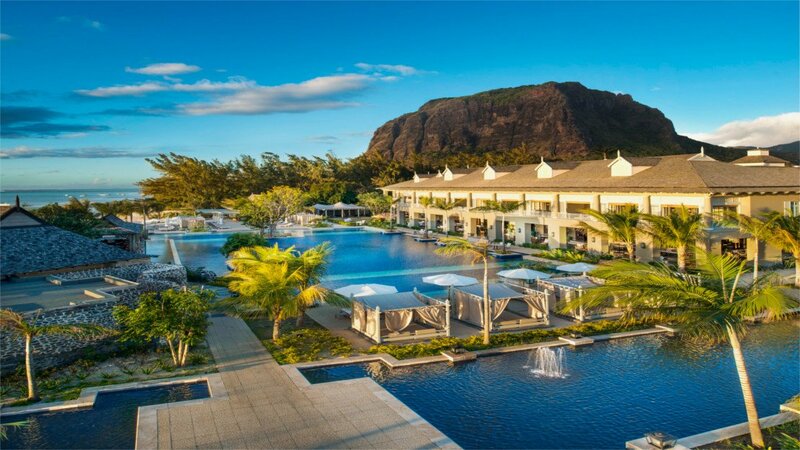 Sir Seewoosagur Ramgoolam International Airport is approximately 56km away from the St Regis Mauritius. A fabulous interior décor that promotes serenity and elegance, this charming 65 square metre garden view room offers a private bar, signature bedding, entertainment centre and St Regis Remede amenities. A crisp contemporary décor that reflects the 5-star style, these beautiful Junior Suites feature natural woods, white and cream décor, serene garden views and plenty of in-room privileges. 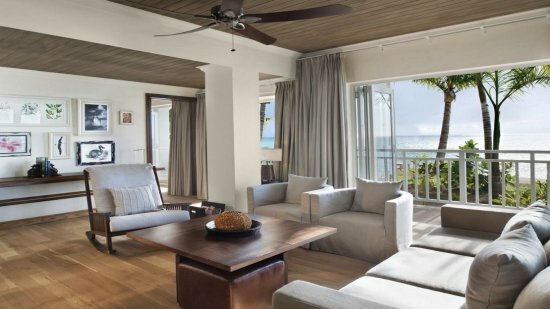 65 square metres of pristine living space that faces onto the beach and offers a beautiful terrace and seating area off the master bedroom is just part of the allure here. It’s modern and contemporary with spacious living at the forefront of this decadent retreat. Fabulously exotic and with beachfront access, this breathtaking accommodation continues the high standards with spacious master bedrooms and terraces looking over the glistening water. Plush linens and furnishings against calm neutral colours and an array of amenities to ensure maximum comfort is a snapshot of what’s in store. An impressive 146 square metres caters for 3 guests in their personal level of luxury. 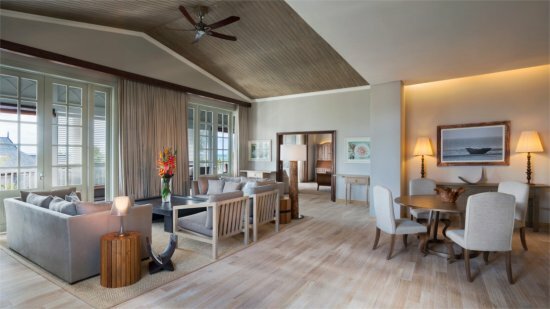 Natural wood is the signature throughout this sophisticated manor suite reminiscent of original private residences. Neutrals, crisp whites and cotton and linen blend perfectly with rattan, wood shutters, and marble creating a fabulous space in which to relax, share an intimate evening with your loved one or prepare for a day of sightseeing. 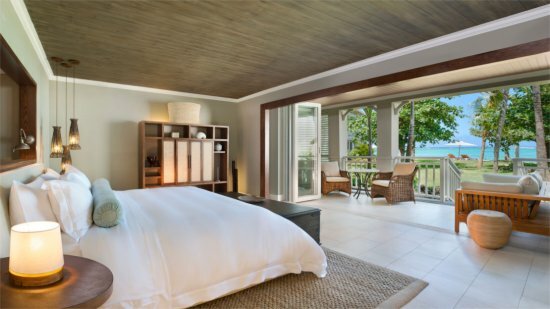 Situated in the main building of the resort, this private luxury will surpass requirements. Relish the 214 square metres of opulence displayed in this manor house choice. Beautifully appointed, the suite features open-plan areas for dining and living, a stunning master bedroom and elegant ensuite with massage table and walk-in dressing room, plus all of the St Regis luxury provisions. Measuring up to 153 square metres, this opulent choice epitomises all that is luxury at St Regis. A fantastic display of crisp linen, wood furnishings and marble décor is complemented by the spacious lounge and dining area. 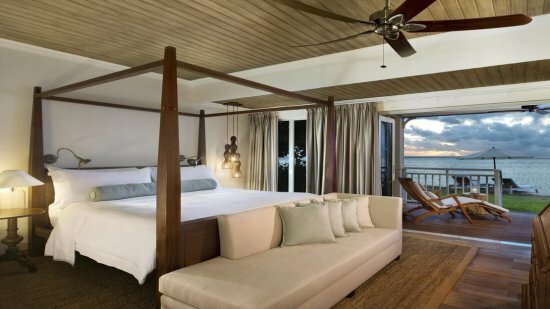 The beautiful and expansive terrace overlooks the ocean and is also furnished with an indulgent daybed for relaxing by the lagoon. There is a wealth of recreational activities here at St Regis, designed to maximise and create lasting memories of your time here, the attentive staff have ensured leisure and wellbeing is at the forefront of this experience. Water sports including surfing, windsurfing, water skiing, kayaking, paddle boarding, glass bottom boat trips and catamaran cruises. Game fishing, stand up paddle, and snorkelling are further options. A sensory experience, gastronomy is at the heart of stylish holidaying and is especially important here at St Regis. A fabulous setting enhances the theme and a range of venues cater for refined dining to quick and casual bites. Sample a range of innovative dishes, classic tastes and smells evoking memories of childhood, and family favourites to please everyone. A stately dining room, here is where exotic Mauritian combine with classic French, Indian and Asian cooking styles in an elegant environment. Stylish and sophisticated, here is where champagne combines with seafood platter of delicate lobster, oysters and grilled prawns whilst your toes dip into sand under fantastic evening lighting that transforms the venue into something even more spectacular. Aromatic choices that delight the eyes and taste buds combine Asia’s most popular regional cuisine at a casual venue that’s charmingly pretty. Savour the fresh seafood, meats and vegetable dishes in a picturesque setting surrounded by water. Simply India takes you on a voyage across the ocean to savour delicious Indian cuisine with low key and vibrant spice mixes that will transport you back in time. Other dining options include 3 private dining experiences where exclusive cuisine prepared according to the chef’s selection and wishes can be sampled. Catering for up to 16 persons, dramatic scenery and vibrant dishes are the order of the day.